I was a bit quiet (and by a bit quiet I mean completely silent) last week because I was busy escaping the cold and enjoying a wonderful lazy beach vacation in the Dominican Republic. I'm back to the cold now but want to reminisce by showing you the polish I chose to wear for my trip. Seeing as how it was a beach vacation Picture Polish Ocean seemed like the perfect choice. This polish features a bright blue jelly base packed with loads of blue holographic micro glitter. The formula was fantastic and easy to apply. 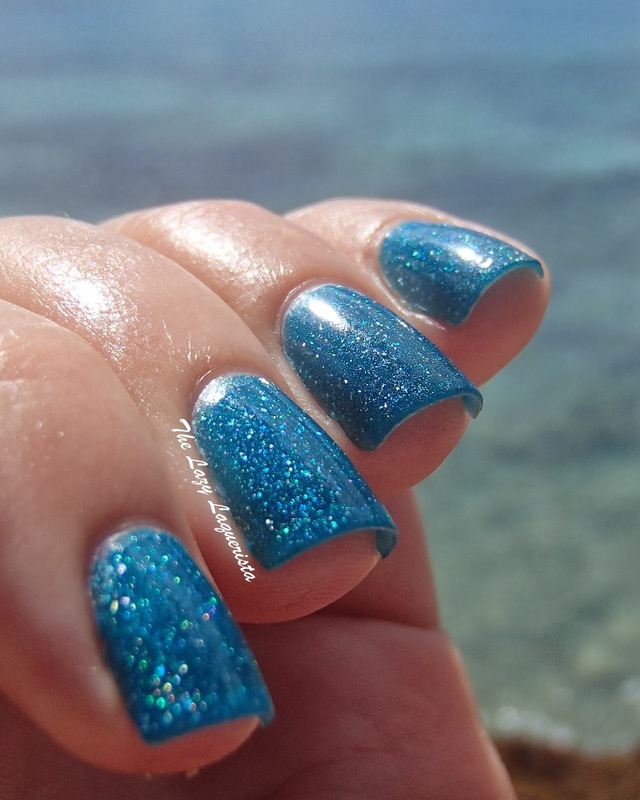 Pictures show three coats of Ocean with one coat of CND Super Shiney top coat in natural lighting in front of the ocean itself. I was really impressed with the wear time of the polish... like really impressed. The photos above were taken on the third day of my trip. Other than some minor tip wear which I touched up a few times through out the week I didn't get any major chips until the very last day. Considering my nails with busy picking at sea shells, getting soaked in saltwater and chlorinated water daily on top of normal use this is amazing. This quality is totally worth the higher price tag. Now that I'm home though, it's time to switch up my polish since this is the first time in a very long time that I've worn the same colour for a whole week. This color is gorgeous, and perfect for the vacation!